Our school libraries research review demonstrates that school libraries can play a vital role in contributing to pupils’ success. 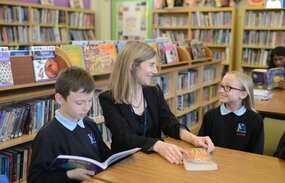 The research found that pupils who use the school library are more likely to enjoy reading, see themselves as good readers and think more positively about reading. This research can help you advocate for your school library to support a reading community in your school and ensure the school library is used effectively. This resource can help you develop your school library provision and demonstrate the wide ranging impact an effective school library can have in your school.